A wood accent wall gives this den a contemporary feel. Is the paint on your walls not living up to your expectations? Or are you looking to break up a room with a bit of decor? Accent walls can be a great way to completely transform any space by making one wall stand out from the others. 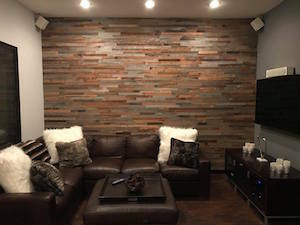 Here at Marshall Exteriors, we have experience creating beautiful accent walls in homes throughout The Greater Finger Lakes Area. We can help you choose the best material for your needs and determine which walls should be emhpasized in your home. With minimal effort, you can turn your drab living room, dining area, bedroom and more into a fabulous space! Interested in learning more about our accent walls? Call us at 1-855-237-7177 or click below to schedule a free estimate! 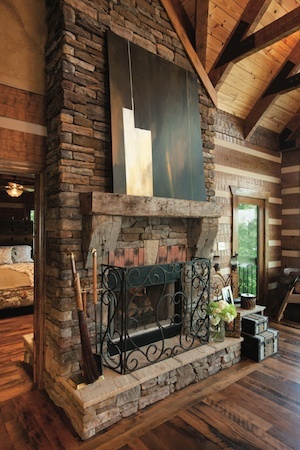 Stone veneer can be used to make fireplaces, walls and other interior and exterior features. No matter how you're looking to change your existing walls, Marshall Exteriors has the perfect solution. Our reclaimed wood planks, taken from barns, fences, and other structures across the country, will give your home a rustic yet stylish feel. These planks are de-nailed and kiln dried to provide maximum stability. If you opt for a stone veneer wall accent, you can happily merge the outdoors with your interior living space. All of our materials come in different types, so whether you're looking for a light or dark aesthetic or a certain kind of stone, we'll work with you to ensure your complete satisfaction with the end result. Recommended for primed and painted surfaces, wallpaper, or any smooth, flat, and solid surface. If using wood planks, keep away from direct sunlight and moist or wet conditions – they could fade, warp, swell, or rot. Not designed to be weight-bearing. Make sure any fasteners are connected to the wall beneath. Wood planks are designed for indoor use only, while stone veneer is available for outside usage. No matter how complete your home may seem, there's always room for improvement - especially when it comes to interior design. Marshall Exteriors has spent many years giving our customers homes they are proud to own, and we live up to this same high standard when it comes to accent walls. Ready to get started on your project? Schedule a free estimate with us today! We offer our services in Fairport, Canandaigua, Geneva, Newark and areas nearby.